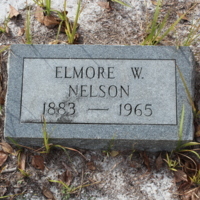 The headstone of Elmore W. Nelson at Viking Cemetery in Fort Pierce, Florida. 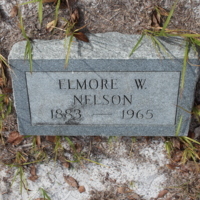 Nelson was born in 1883 and died in 1965. Viking Cemetery is one of the last remaining pieces of the small town of Fort Pierce, Florida. The area was first settled in 1892 by Major B. Daniels (1860-1947), who used the land largely to grow pineapple, a significant crop in Florida at the time. By 1895, Norwegian immigrant Jens Helseth (1858-1944) moved to the area and also grew pineapple on his 80-acre farm. From these early homesteads, the tiny village of Viking grew, named so due to the abundance of Scandinavian families who settled there. Helseth granted a portion of his homestead to serve as the community cemetery by 1905, the date of the first interment. It has since then served the descendants of Helseth, his family, and friends in the small community. The cemetery is today privately owned by the great-great grandchildren of Helseth, who maintain the site. 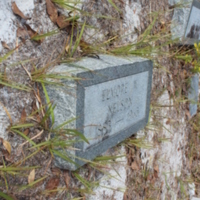 Original color digital image,2016-01-21: Order 49, Field Specimen SL11151, Florida Historic Cemetery Recording Project, Florida Public Archaeology Network , Division of Anthropology and Archaeology, University of West Florida, Pensacola, Florida. Order 49, Project 1, Florida Historic Cemetery Recording Project, Viking Cemetery Collection, Florida Historic Cemenetery Recording Project Collection, RICHES of Central Florida. 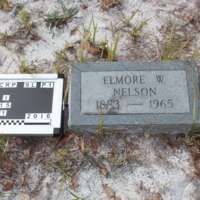 “Headstone of Elmore W. Nelson at Viking Cemetery .” RICHES of Central Florida accessed April 23, 2019, https://richesmi.cah.ucf.edu/omeka/items/show/7318.